Heat oven to 350°F. Line 8-inch square baking pan with double thickness of aluminum foil, extending foil over ends of pan. Spray foil with no-stick cooking spray. Combine crushed graham crackers and butter in small bowl. Press onto bottom of prepared pan. Combine caramels and cream in medium microwave-safe bowl. Microwave on HIGH (100% power) 1 minute; stir. Continue microwaving 30 seconds; stir until smooth. Pour over crust in pan. Refrigerate while preparing cream cheese mixture. Combine softened cream cheese and sugar in large bowl. Beat at medium speed, scraping bowl often, until creamy. Add egg and vanilla, beating just until combined. Stir in sour cream. Pour over caramel mixture. Bake for 30 to 40 minutes or until just set 2 inches from edge of pan. Cool on wire rack for 2 hours. Loosely cover; refrigerate at least 4 hours. (I chilled mine overnight.) Lift cheesecake from pan using foil ends. Cut into one inch squares about 49 squares. Place squares on a parchment lined baking sheet and freeze for 1 hour before dipping in to chocolate. Combine chocolate chips and shortening in 1-quart saucepan. Cook over low heat, stirring constantly, until smooth (4 to 5 minutes). (I used a double broiler.) 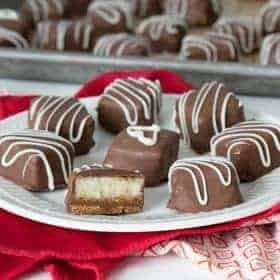 Dip each cheesecake square in to the chocolate; remove from the chocolate with a fork and allow excess chocolate to drip back in to the pan before placing the square back on to the parchment lined baking sheet. Let stand about 20 minutes or until chocolate is firm. Store refrigerated.